Styled and centred in a prime location of Seri Kembangan, SK One Avenue comprises 31 units of retails shops situated beneath SK One Residence serviced apartments. Sitting on a 3.4 acres of freehold land, this mixed-used development comprises 429 of serviced apartments and retailers of SK One Avenue will enjoy huge ready catchment of 150,000 population from immediate residences and surroundings. Strategically located within a matured township with ready infrastructure and awesome amenities, SK One Avenue is an ideal choice for business owners to run a variety of businesses including F&B, boutique, supermarket, laundry and convenience store. The single-storey retail shops come with ample car park bays for visitors. This integrated development was completed with vacant possession delivered to purchasers in August 2017. This is the latest addition to the vibrant and colourful Seri Kembangan skyline. Business owners will enjoy immediate catchment and high visibility at this newly completed retail shops. 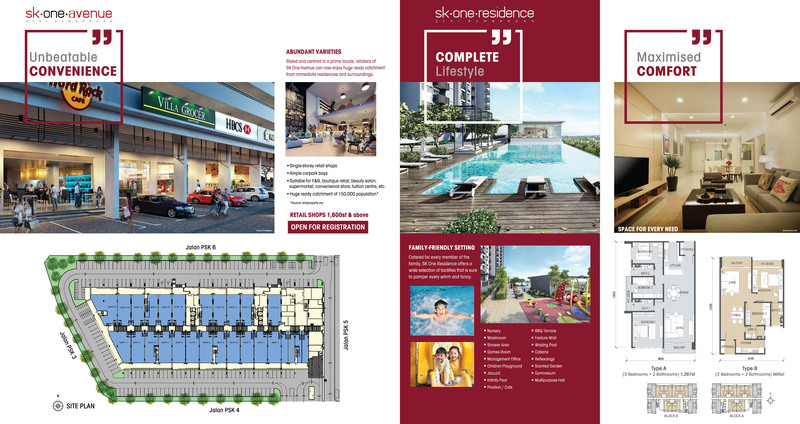 SK One Residence, an urban living in a vibrant community is designed with a perfect synergy of comfort, seamless connectivity and unbeatable convenience. Convenience is the last thing to worry about as residents can go no further from the doorway to buy their daily needs or even run their own business with retail shops beneath the serviced apartments. Geared towards discerning lifestyle, residents will get to enjoy the full condominium facilities while living in a secure, vibrant and township.